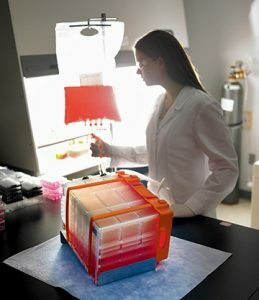 The adoption of viral vector technology in cell and gene therapy has led to six month waiting lists for multilayer culture vessels. Hyperstack vendor Corning says it will more than double its manufacturing capacity to deal with the demand. Despite being a registered brand owned by Corning Life Sciences, ‘hyperstack’ has become a common term to describe multilayer, scalable, and single-use culture flasks. They are used to produce viral vectors and gene therapies, and are in huge demand, according to Reinout Hesselink, an expert on cell and gene therapies and a consultant at eXmoor Pharma Concepts. He told BioProcess Insider a surge in gene therapy development has led to shortages and long waiting lists – “one client said it was six months” – furthered by a lack of capacity from the only two vendors producing such products: Corning and Nunc (part of Thermo Fisher Scientific). “There is an increase in the number of gene therapies getting to later-stage development that use hyperstacks in their processing, and vendors can’t keep up,” he said. Spun out of academia, gene therapies have traditionally been made in 175 ml culture vessels, he continued, but hyperstack systems with double-digit layers have offered industry a quick way to scale-up production. 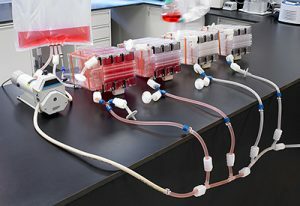 “[Gene therapy makers] would like to scale-up into bioreactors but there is not always the time and money to do this as people want clinical results as soon as possible, and therefore use increasing numbers of hyperstacks to scale out. 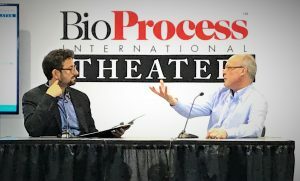 Andy Topping, chief scientific officer at Fujifilm Diosynth Biotechnologies, confirmed the shortage during a BPI Theater interview at BIO, Boston in June. Topping added the sudden surge has taken the vendors “as much by surprise as anyone else,” though Hesselink said he believes a similar shortage a few years back driven by increased interest in mesenchymal stem cells (MSCs). Chris Ward, a spokesperson from Corning, said his firm is alert to the “rapid adoption of viral vector technology in cell and gene therapy,” which has caused the shortage. Furthermore, Corning is looking to alleviate the shortage through several capacity expansions. These include qualifying a second source for gamma sterilization, optimizing its current operations, and adding a new production line, which it anticipates will be validated and operational during Q1 2019. Nunc owner Thermo Fisher declined to comment on the hyperstack shortage when contacted by BioProcess Insider.